The warm, sunny days of summertime are perfect for sharing great food and great beer with friends & family. When the beer is part of the recipe, everybody wins! We teamed up with Chef Kenneth Hernandez, Culinary Engineer and Founder of Collective Green SF, earlier this summer to create some fun recipes for guests to enjoy with their picnics at San Francisco’s Stern Grove Festival. 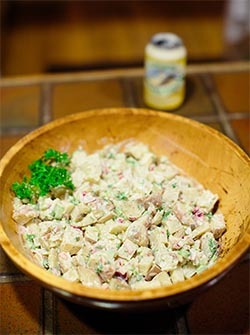 The first of Chef Hernandez’ culinary creations is a potato salad made with Anchor Summer Wheat®, which makes a tasty complement to virtually any summer meal. 1) Soak diced red onions in red wine vinegar for at least 1 hour. 2) Bring Anchor Summer Wheat and vegetable stock or water to a boil and simmer for 3 minutes with bay leaves. Add potatoes and cook until soft. 3) Combine the rest of the ingredients in a bowl (red onions should be removed from red wine vinegar), add potatoes. 4) Add salt, pepper, mustard powder, paprika, and lemon juice/red wine vinegar to taste.